Fully 75% of adults say that adult children have a responsibility to provide financial assistance to an elderly parent in need. Only 23% say this is not an adult child’s responsibility. 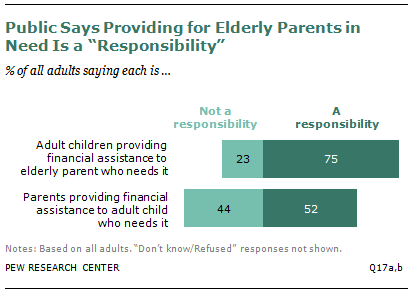 By contrast, only about half of all respondents (52%) say parents have a responsibility to provide financial assistance to a grown child if he or she needs it. Some 44% say parents do not have a responsibility to do this. When it comes to providing financial support to an aging parent in need, there is strong support for the responsibility to do so across most major demographic groups. However, there are significant differences across age groups. Adults under age 40 are the most likely to say an adult child has a responsibility to support an elderly parent in need. Eight-in-ten in this age group (81%) say this is a responsibility, compared with 75% of middle-aged adults and 68% of those ages 60 or older.